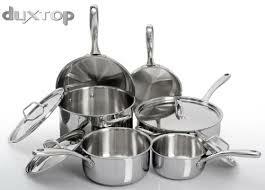 If you are planning to purchase a stainless steel set you will have to consider the chromium/nickel ratio. You should look for the 18/10 ratio, that’s how you determine how good your stainless steel cookware is. Next thing to take into consideration is its core. High quality stainless cook wares should have copper and aluminium or both inside, so you will have even heat distribution. Then lastly look for “All-clad” or “Clad” products, from there you will be able to determine that you have your money’s worth without sacrificing the quality of the cookware. One of the best tri-ply stainless steel set there is. This is a 12-piece set with aluminium core that is oven safe up to 500°F. With its aluminium core inside two layers of stainless steel, superior heat conductivity is guaranteed. This wonderful set falls under the “All-Clad” section with comfortable rims so pouring liquid is much easier. Professionals and kitchen lovers wants a well-engineered piece of kitchen gear and this set right here is a total win. This set is unbeatable when it comes to its functionality, sturdiness and superior performance. 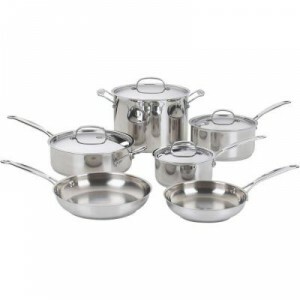 With about a $100 you can get this nice 12-piece set of quality stainless steel cookware. This set comes with multi-layer stainless steel core with copper disc. Its professional looking with useful measurements inside. It is also dishwasher safe so cleaning is a breeze. The set is also oven safe until 500°F. This is a good starter set that maximizes quality and classy design. A definite must have. This set 10-piece set is made of Tri-ply 18/10 stainless steel with aluminium core. It also has magnetic stainless layers with a flat bottom that is great for gas, halogen and induction ranges. Aside from being oven safe until 500°F, it is also freezer safe. If you are looking for a great, well-made stainless steel cookware for induction/convection or other type of ranges, the Duxtop Whole-Clad Tri-ply is one of the best choice. The All-Clad Stainless Gourmet is a 10-piece set made of Tri-ply 18/10 stainless steel, also with an aluminium core and is oven safe until 800°F. This one is a multi-purpose cookware set that is greatly accepted by cookware enthusiast and professionals. This set has superior quality, purely made in the U.S. It also comes with a lifetime warranty that will give you the peace of mind and above all, your money’s worth. 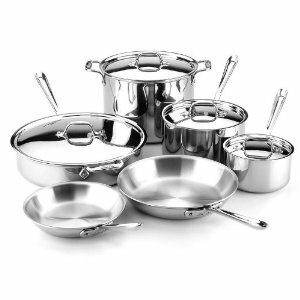 This 10-piece 18/10 stainless set is a great starter set with aluminium disc. This quality cookware set can be yours under $200. 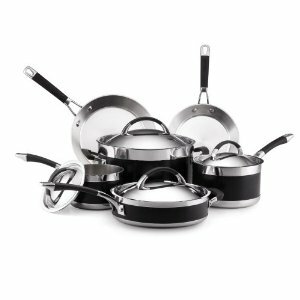 So much like an entry-level stainless steel set that has almost all of the high-end features of the above mentioned cookware. This one is a 12-piece Tri-ply 18/10 Stainless set. Oven safe until 550°F, and has an overall professional look. It is among the “All-clad” section so you can also say that this one is a superior kitchen gear. It also have positive feedbacks from consumer reviews, great quality and value without breaking the bank. 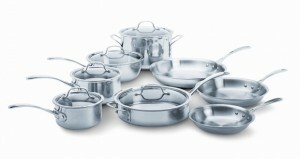 The Cuisinart Chef’s Classis is a 10-piece Tri-ply stainless set with an aluminium encapsulated base. This kitchen gear is inspired by France Kitchen. It has a sturdy engineering, even heat distribution and also dishwasher safe. It also comes with a variety of 7,10,11,14 and 17 piece sets. 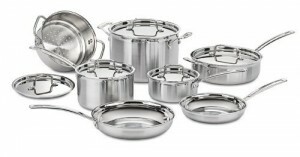 The KitchenAid Gourmet is a 10-piece set made out of brushed stainless steel. 18/10 stainless steel encapsulates the aluminium disc base with stay cool handles. It came from a long line of Gourmet Essential products and have great ratings based on Consumer Reports. A good starter set for your kitchen. What can you expect from this set? It offers a superior 13-piece, tri-ply stainless wraps aluminium base for great heat distribution. Plus it is compatible with induction and most stove ranges. It is also dishwasher safe and comes with a lifetime warranty. Not that pricey and you will be assured of the quality as well. 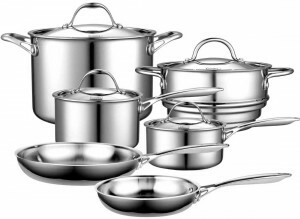 The Anolon Ultra Clad is a 10-piece set made of brushed stainless. It also has an aluminium core and is oven safe until 400°F. If you are looking for a quality, efficient cookware set without spending that much, you may look into purchasing this set. It also falls under the “Clad” section so, performance wise there will be no question as testified by Consumer Reports. It also comes with a luxurious design and effective engineering.